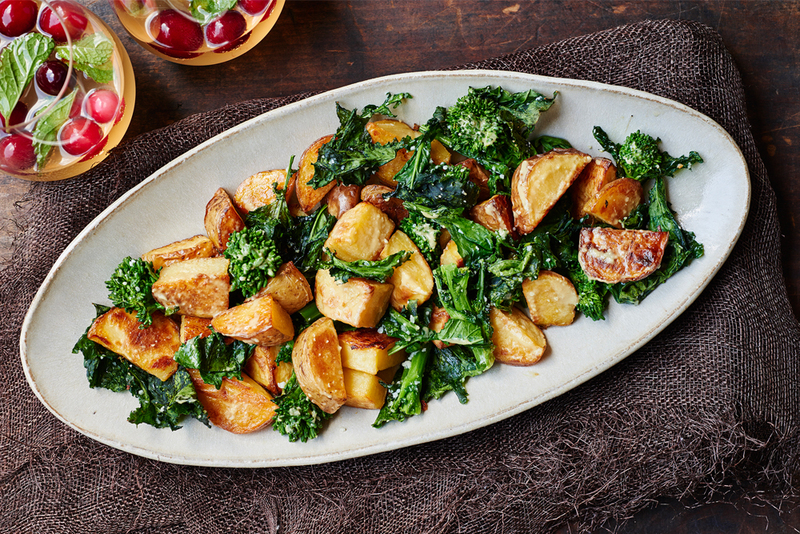 This delicious side dish features golden roasted potatoes and tender, roasted broccoli rabe with Parmesan cheese melted into it. 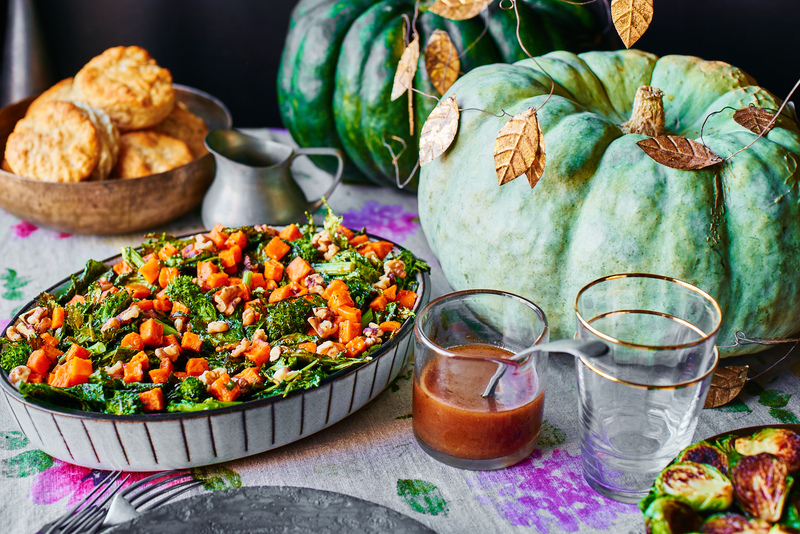 The dish comes together quickly—you can prepare the broccoli rabe and dressing while the potatoes roast for the first 22 minutes, then roast the broccoli rabe on the upper rack until it’s tender and the leaves are a little crisp. A simple, zippy blend of lemon, mustard and garlic absorbs right into the potatoes and makes this dish extra flavorful. Kate is the author of the vegetarian food blog Cookie and Kate, which was a finalist for Saveur’s “Best Cooking Blog” in 2012. Her partner in crime is Cookie, a cheerful mutt who does his best to clean up after Kate in the kitchen. She published her first cookbook, Love Real Food, a book of fresh, wholesome, sustainable vegetarian favorites. 1. Preheat oven to 425ºF with racks in the middle of the oven and upper third of the oven. Slice the potatoes into 3/4-inch pieces. On a large, rimmed baking sheet, toss the potatoes with 2 tablespoons olive oil and a sprinkle of salt and pepper. Bake for 30 minutes, turning halfway. 2. Meanwhile, prepare the broccoli rabe by rinsing it and spinning it dry in a salad spinner or patting it dry. Slice off the tough lower ends and any stems that are greater than 1/4-inch in diameter and discard those pieces. Roughly chop the remaining rabe into 2 to 3-inch pieces. 3. 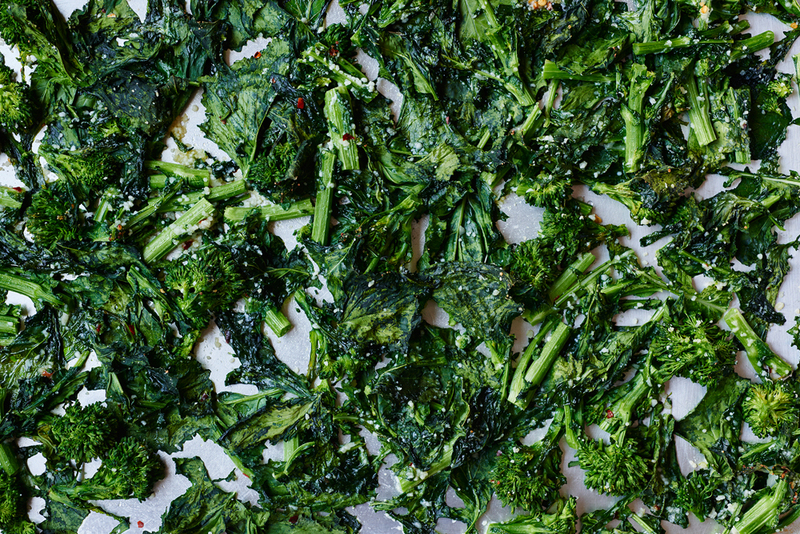 On a separate large baking sheet, combine the broccoli rabe with one tablespoon olive oil, 1/4 cup Parmesan, a pinch of red pepper flakes and a sprinkle of salt and pepper. Use your hands to rub the ingredients into the broccoli rabe, so it’s lightly coated in oil. 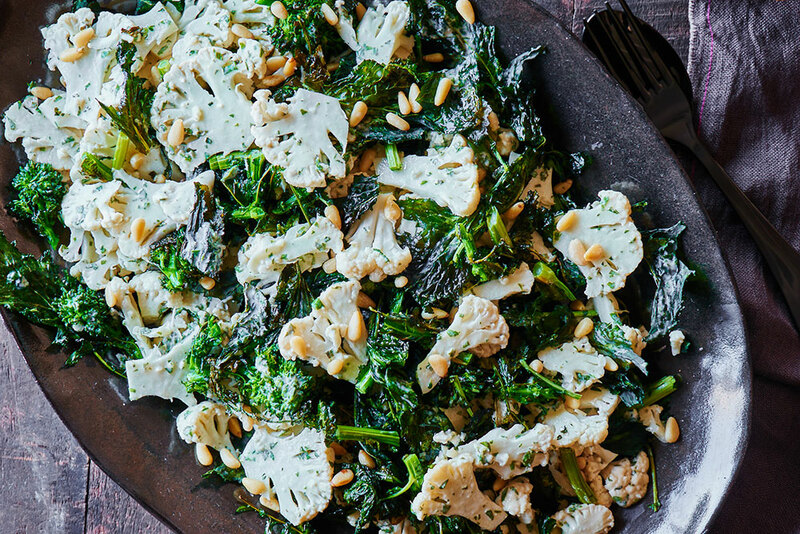 Arrange the broccoli rabe in a single layer. Once the potatoes have only 8 minutes baking time remaining, place the baking sheet on the upper rack in the oven. 4. Whisk together the dressing ingredients while you wait. 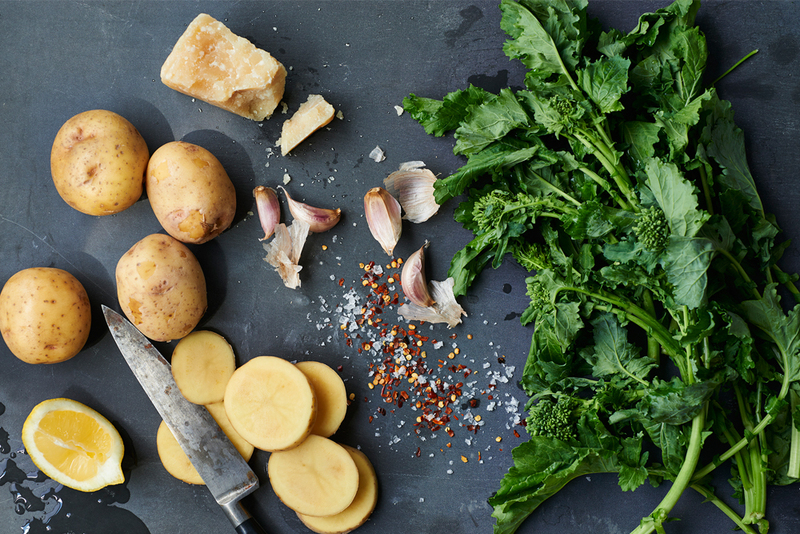 Once the timer goes off, the broccoli rabe should be tender and turning crispy in places, and the potatoes should be golden and tender throughout. If not, leave one or both pans in the oven a couple more minutes. 5. 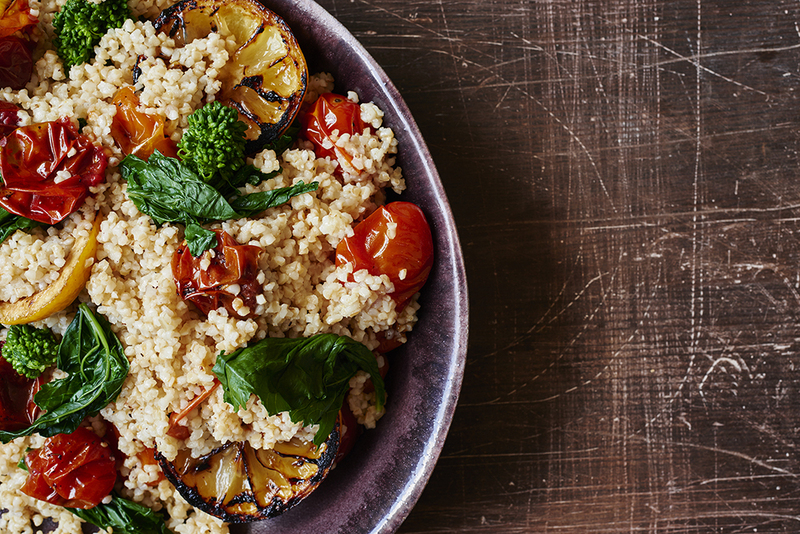 Transfer the contents of both pans to a bowl and drizzle the dressing into the bowl. Toss to mix well, then season to taste with salt and pepper. Serve immediately.